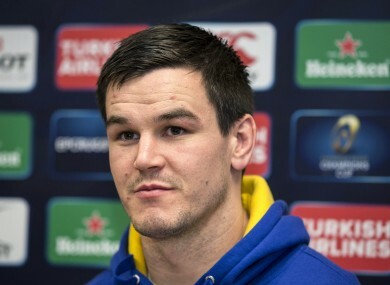 LEINSTER COACH LEO Cullen has rung the changes for his side’s final Champions Cup pool game, away to Wasps tomorrow. Eleven changes have been made to the team that beat Bath last time out with only Zane Kirchner, Dave Kearney, Rhys Ruddock and Jordi Murphy retained in the starting XV for the trip to Coventry. Having been announced as one of Leinster’s vice-captains at the start of the season, Johnny Sexton will captain Leinster for the first time in what will be his 100th start for the province in 121 appearances. Club captain Isa Nacewa is not included in the 23 after picking up a knock against Bath. With Rob Kearney coming in to fullback, Zane Kirchner moves to the right wing from the number 15 slot last week, with Dave Kearney continuing on the left wing. Noel Reid and Luke Fitzgerald come into the centre with Eoin Reddan selected alongside Sexton in the halfbacks. Jack McGrath, Sean Cronin and Marty Moore will start in the front row after all three were named in the Ireland Six Nations squad on Wednesday. Devin Toner and Rhys Ruddock are in the second row, making it 11 starts this season for Ruddock, who has played the full 80 minutes in each game to date. In the back row, Dominic Ryan, Jordi Murphy and Jamie Heaslip complete the pack as Leinster look to finish their European campaign on a high. The bench includes three players who were named in the Irish Six Nations squad including the 22-year-old uncapped back-rower Josh van der Flier, while Cathal Marsh is in line to make his European debut should he come on. The game kicks off at 3.15pm tomorrow and will be live on BT Sport and Newstalk. Email “Sexton to captain Leinster for first time as Cullen rings changes”. Feedback on “Sexton to captain Leinster for first time as Cullen rings changes”.